The greatest fairy tale never told comes to life as never before in DreamWorks’ Shrek The Musical, the highly acclaimed Broadway production based on the smash-hit movie. Shrek The Musical received eight 2009 Tony Award® nominations including Best Musical, winning Best Costume Design of a Musical (Tim Hatley) and received a Grammy Award® nomination for Best Musical Show Album. Fans can join in on the performance with sing along Shrek-tastic songs on the Deluxe Edition Blu-ray™ + DVD + Digital HD™ or single-disc DVD! Shrek is one of my all-time favourite animated movies. I watched it with my daughter, Olivia, when she was just a toddler. Since then it’s been played more times than I can count and loved by both my daughters. I’d heard that Shrek The Musical was on Broadway a few years back. I never got to see it while it had its run unfortunately. I heard that it was being released by DreamWorks on Blu-ray/DVD and I knew I had to watch it! Shrek The Musical is basically the same storyline as I remember it from the movie. However, it’s told through mostly song and includes 17 all-new songs and many of my favourite songs from the movie. I love the one sung by the dolls of Duloc that goes something like “Welcome to Duloc….”. It always cracks me up! There’s the same characters including Shrek, Donkey, Princess Fiona, Lord Farquaad, and lots more! My favourite character was Donkey. He’s hilarious and the actor who portrayed him in the musical really captured his fun spirit. Some of the humour will go over younger kids heads, but adults will understand it. It’s fine for kids to watch though. There’s fart jokes, but its basically the same type of crude humour like in the movie. The costumes and set is elaborate and detailed. They really created an amazing and realistic setting and I can’t even fathom the work (and $) that went into the production. Watching the Blu-ray was like having a front row seat at the Broadway show. I loved being able to see the actors close up and be mesmerized by their performances. It’s the next best thing than actually being there for the live performance. 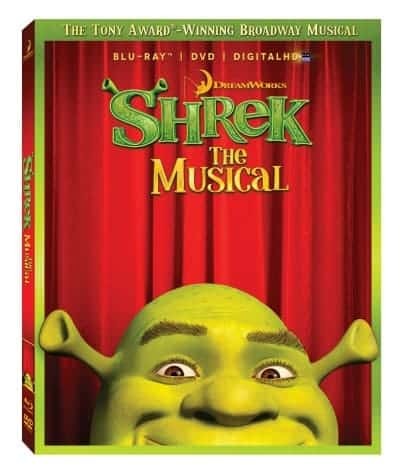 Shrek the Musical is no longer on Broadway so if you never got to see it, watch the Blu-ray/DVD! Join the #MexicanFiesta Twitter Party on 11/7 at 8pm EST! It has to be Donkey! Donkey is Shrek’b best sidekick. I have to go with Donkey! I would have to go with Donkey. Donkey is definitely the best!